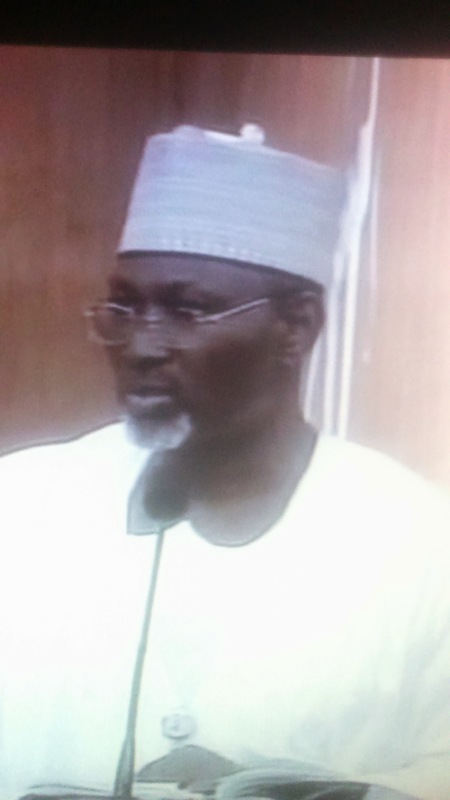 Independent National Electoral Commission (INEC) Chairman, Professor Attahiru Jega whilst answering questions from Senators at the plenary session of the Senate today where senators asked him several questions regarding the forthcoming elections. Senator Gbenga Ashafa representing Lagos East senatorial district sought the assurance of the INEC Chairman that elections would hold on March 28 for Presidential and National Assembly elections whilst Gubernatorial and State House of Assembly elections would hold on April 11, 2015. Responding to this, Professor Jega stated that it was difficult to give such a guarantee because "there are things under INEC's control and there are things outside of INEC's control. It is futile to make pronouncements on things that are outside of INEC's control." He said questions about things outside of INEC control should be directed to the appropriate quarters. Professor Jega also explained that it is not possible to use Temporary Voters Card (TVC)because it had been discovered that there are 4 million people who did double registration to obtain them and their names had been struck out of the voter's register. Attempting to use TVCs on election day would lead to chaos as the people with TVCs that had committed double registration fraud would not be able to vote and would protest at polling units as happened in Anambra during the gubernatorial election there in 2013.